Gaen is officially introduced during Tsubasa Tiger when she conveniently runs into Tsubasa Hanekawa en route to pick up vampire hunter Episode, of Kizumonogatari fame. Her introduction consists of a cell phone, a rainbow-colored sky, and her catchphrase. This quick conversation marks the first of many Gaen appearances where Meme Oshino’s upperclassmen — or adorable little sister within the context of Shinobu Mail — descends upon Koyomi Araragi’s hometown, dispensing advice to Araragi and company with a mocking lilt in her voice. A conduit of information, Gaen is never without a mobile device and is sometimes pictured with several in her possession. 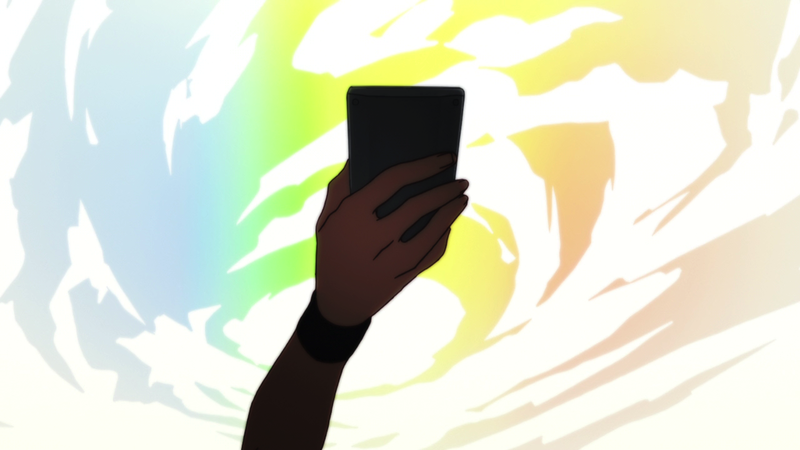 She is first shown as a simple hand dramatically brandishing a cell phone in the air against a rainbow-colored backdrop. Rather than one color assignment — like Tsubasa Hanekawa with white, Shinobu Oshino with yellow, Koyomi Araragi with black, and so on — Gaen possesses all colors at nearly all times. 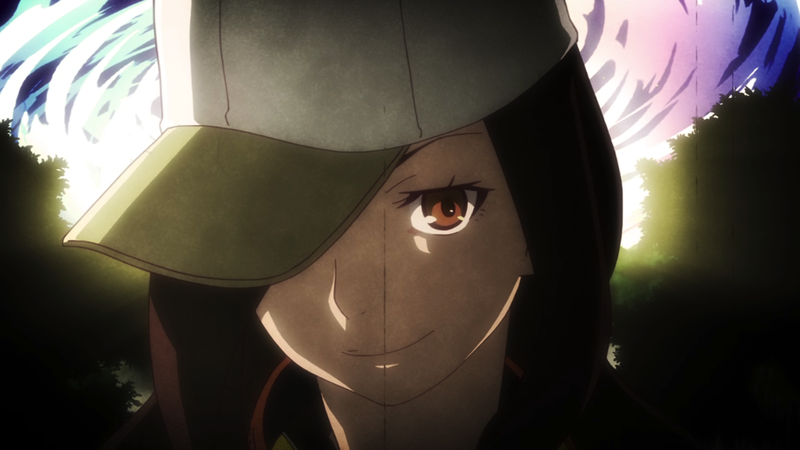 Quick cuts to dialogue, or the series of snapshots from Araragi in the first episode of Shinobu Mail, focus on one color or a sequence of colors. Gaen owns the entire color spectrum. 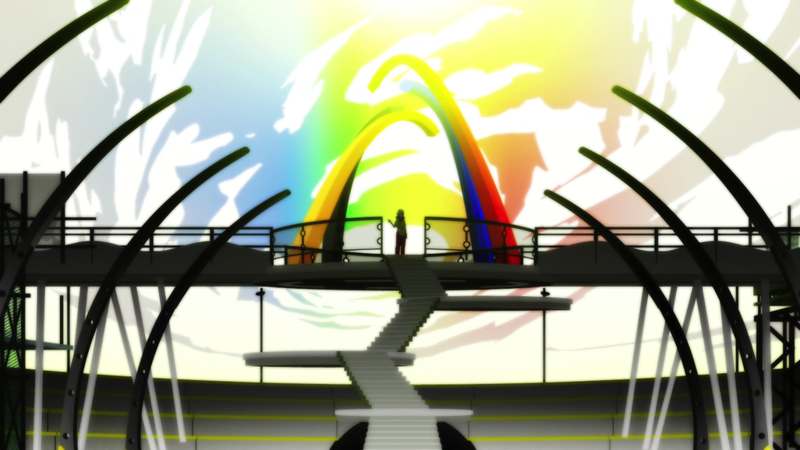 Shinobu Mail‘s use of color preps the viewer to digest Gaen in all her rainbow glory when she appears at the North Shirahebi Shrine. The first episode uses both additive and subtractive color primaries, along with the subtractive color model in sequence. Subtractive color models are used primarily in pigments and dyes, while additive color models are used for light. Rainbows are created by light refracting off of water droplets in the sky. When all colors in the light spectrum are added together, they create light. That white light is dispelled and separated by refraction, creating the optical illusion of a rainbow with the entire color spectrum visible. A rainbow follows Gaen wherever she goes, as if Gaen herself distorts the light around her. It’s no coincidence that the first person Gaen speaks with is Tsubasa Hanekawa within the Tsubasa Tiger arc. Hanekawa has long gone by the catchphrase of, “I don’t know everything, I only know what I know.” which became a shield to handily disguise her desperate desire for perfection. Following the conclusion of her emotional narrative and subsequent transformation, Hanekawa is often compared to Gaen due to her deductive skills, intelligence, and reasoning. We hear her catchphrase before Gaen’s, and it’s repeated frequently enough that it’s impossible not to compare the two once Gaen is introduced. Represented by white, Hanekawa also can be said to be represented by light itself. Where Gaen refracts light around her, Hanekawa becomes a similarly powerful person who doesn’t bend, or refract, light but is it. Whether this makes her more or less powerful than Gaen is up for debate. Following Tsubasa Tiger, Hanekawa transforms into someone who, rather than chasing an impossible ideal of perfection, sets aside the facade in order to help those she cares about. Gaen is known for her immense network of friends and acquaintances, although she uses them for undisclosed future favors, which only adds to her power. 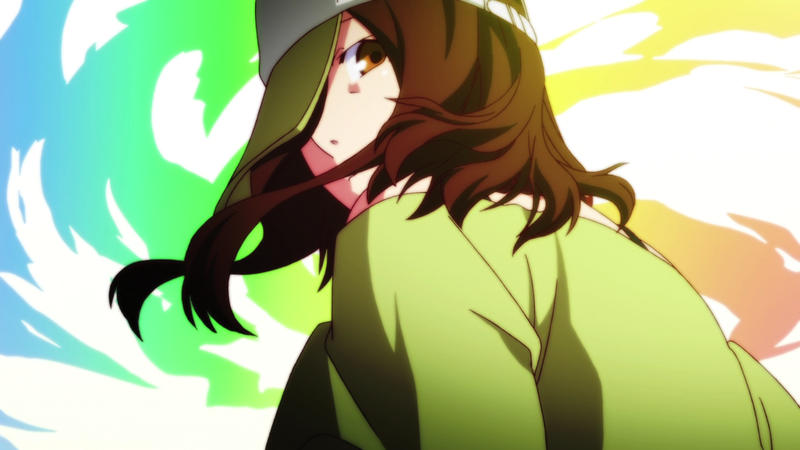 Gaen is one of the more powerful entities within the Monogatari series — or, at least, one of the most informed ones — and the franchise makes this even more apparent with rainbows appearing behind her consistently. This phenomenon occurs even in the middle of the night, when Gaen talks to Suruga Kanbaru, Araragi, and Shinobu about their latest predicament and Shinobu’s first minion in Shinobu Mail. Rainbows are ultimately optical illusions. If light isn’t refracting off of raindrops or water droplets in the air, a person will only see regular light. 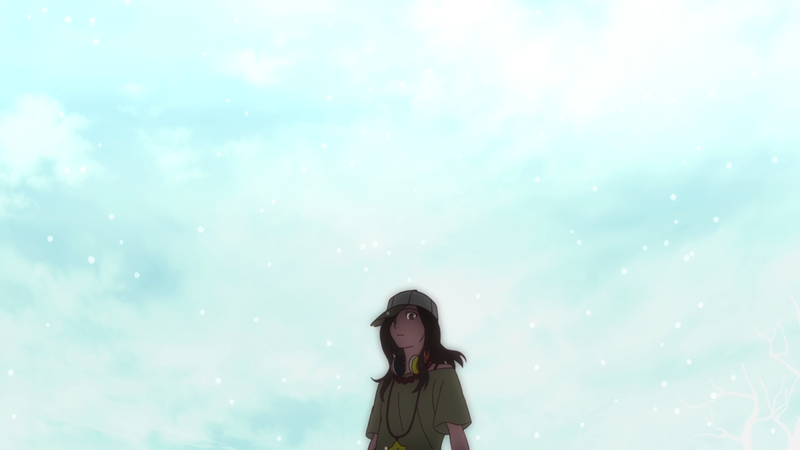 The one instance where Gaen does not appear with a rainbow or burst of color behind her, the sky bending unnaturally with her at the center, is in the final episode of Koyomimonogatari, Koyomi Dead. Rather than her usual pops of color and effervescent attitude, Gaen is more subdued and seemingly tired in Koyomi Dead. This is the one time that Gaen’s rainbow-colored sky doesn’t appear in the series. 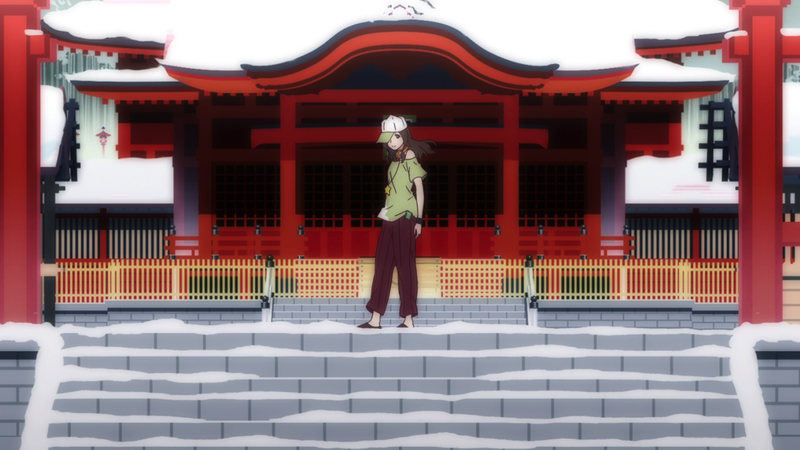 Gaen lists that all of her connections — and Araragi’s connections — have failed. Gaen’s machinations have failed, thanks to Ougi Oshino. 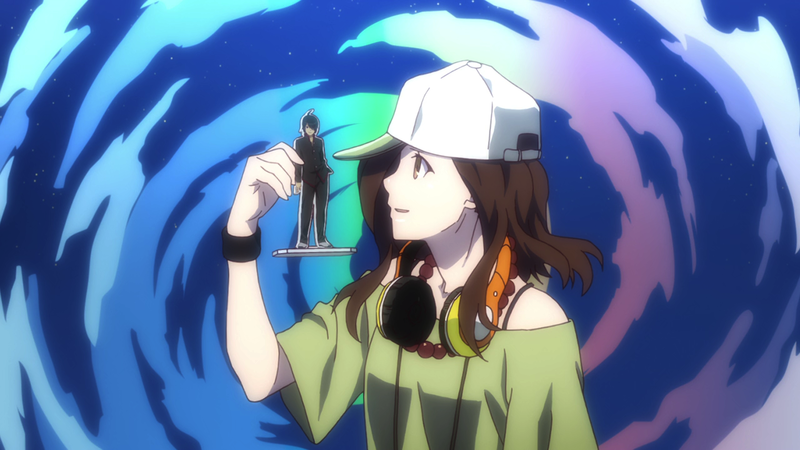 Her only choice now is to kill Araragi. 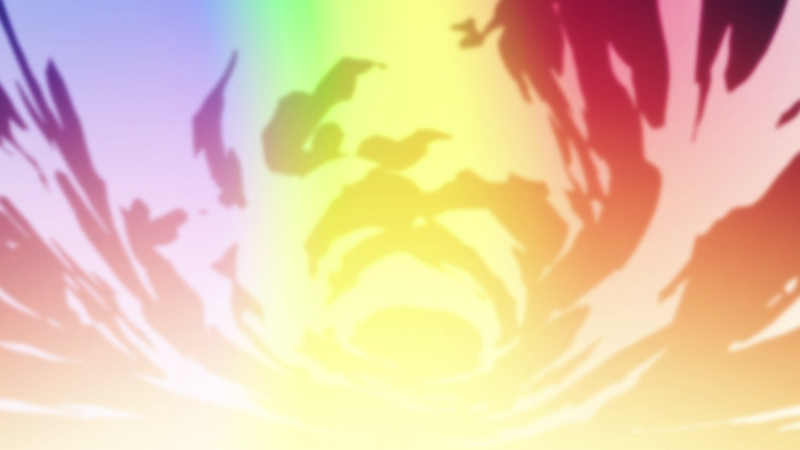 The illusion of the rainbow, and Gaen’s omnipotence, disappears. 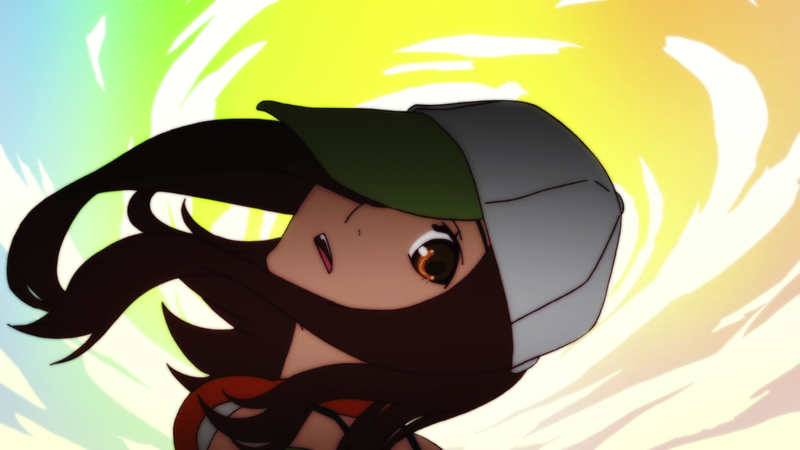 What was that about Ararararararagi? Lol. Love the post. Great detail and it’s about one of my all time favourites!